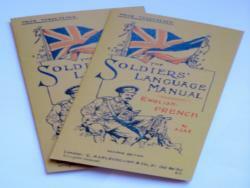 Card cover only (5"x3") Red & blue on buff, "The Soldiers' Language Manual", English / French. Features draped Union Flag and French Tricolour and a Tommy gunner studiously reading this manual. Ideal as a cover for a tunic pocket note book.